Hurricane was established to discover, appraise and develop hydrocarbon resources from naturally fractured basement reservoirs. Hurricane’s strategy is to create shareholder value through monetising the significant reserves and resources associated with the naturally fractured basement reservoirs within its portfolio through exploration, appraisal and development. Hurricane Energy was founded in 2005 by Dr Robert Trice and is now a leading listed exploration and production company. Hurricane's Board is committed to applying the appropriate high standards of corporate governance commensurate with its size and maturity, and recognises its responsibility to serve the interests of its stakeholders in managing the company. Hurricane’s assets are focussed on the Rona Ridge, in the west of Shetland region of the UK Continental Shelf. Explore our licences with our interactive map. Summaries of Hurricane’s reserves and resources and Competent Persons Reports downloads. Fractured basement reservoirs are prolific producers globally but represent a new play on the UK Continental Shelf. The first basement reservoir development on the UK Continental Shelf, 100% owned by Hurricane. Our expertise is in naturally fractured reservoirs. Browse our technical papers and presentations. At Hurricane, our first priorities are ensuring the safety of personnel and protecting the environment. We also focus on the social and governance issues that are of significance to our business and stakeholders. At Hurricane, we are committed to building a solid safety culture from the grassroots level. Hurricane recognises its responsibility to the environment and will take positive steps to address the environmental impacts associated with all its operations. Hurricane’s six core policies: Health and Safety, People, Environmental, Assurance, Ethics and CMAPP. Hurricane’s latest investor presentations, financial reports and other investor information. Hurricane's latest financial results and reports. Download Hurricane's latest presentations or browse our archive. Browse Hurricane's regulatory announcements or sign up for our alerts service. Download documentation relating to Hurricane's general meetings. Hurricane is quoted on the London Stock Exchange's AIM market (ticker: HUR). Relevant shareholder contacts and other information for our investors. Details of Hurricane’s convertible bonds due 2022. Details of the research analysts covering Hurricane and links to publicly available research. Information disclosed in compliance with AIM Rule 26. Access Hurricane Energy plc’s documentation. Download our Admission Document and placing circulars. View images from our archive. Contact details for media enquiries. Current status of hiring and CV submission tool. Sign up for email alerts when we release an announcement. Hurricane’s assets are focussed on the Rona Ridge, in the West of Shetland region of the UK Continental Shelf. Background information on each of our assets is available beneath the overview map for each licence selected. Explore Hurricane’s asset portfolio by selecting a licence on the map above. It is Hurricane’s view that Lancaster and Halifax have the potential to be part of a single, large accumulation, the Greater Lancaster Area (GLA). Hurricane owns 100% of the licences covering this accumulation, P1368 Central and P2308. The Lancaster Field is located in blocks 205/21a, 205/22a and 205/26b, licence P1368 Central. Hurricane has a 100% interest in this licence. The Lancaster Field was discovered by Hurricane in 2009. It sits in relatively shallow water of around 160m. Hurricane are implementing a phased development on Lancaster using the two horizontal wells drilled on the structure. The first phase of the development the Early Production System (EPS) is due to come on stream in 1H 2019. The data acquired during the EPS phase of production will help optimise well locations for future development phases in order to maximise production from the field. 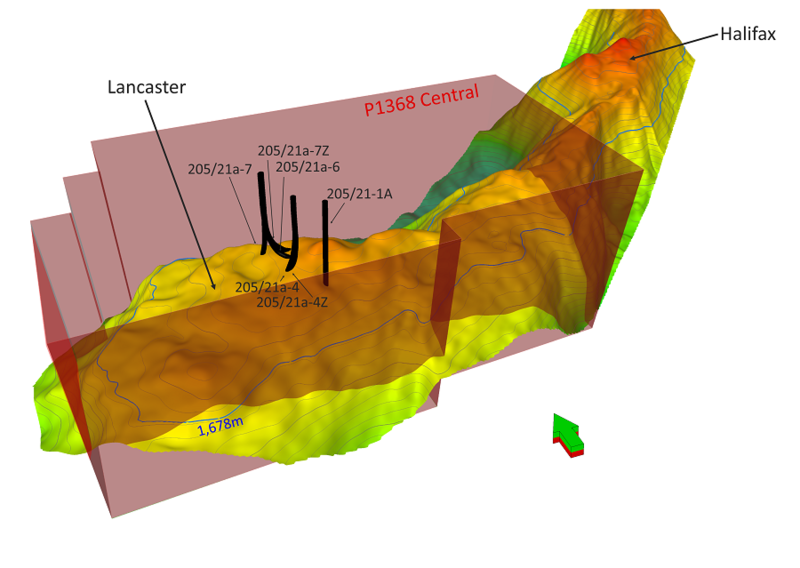 The UK’s first ever exploration well targeted at a basement reservoir was drilled by Hurricane in 2009 on Lancaster. 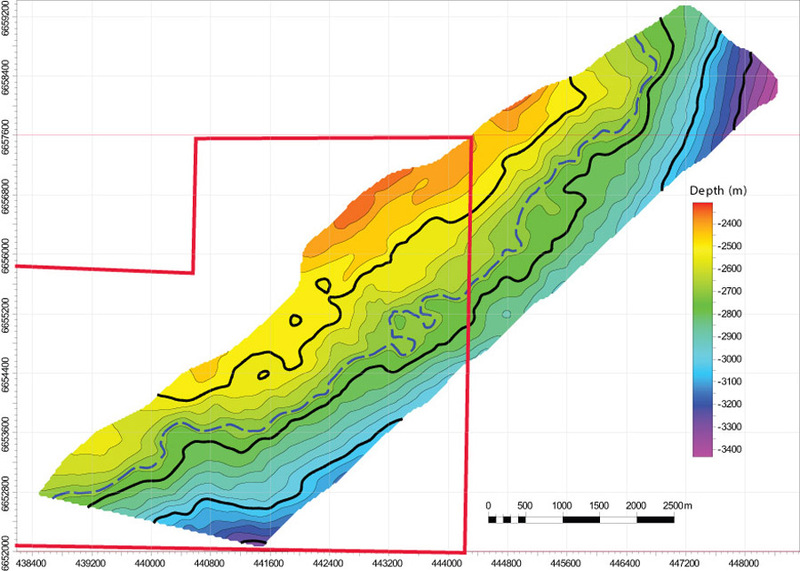 The well, 205/21a-4, discovered a pervasive fracture network and flowed light (38° API) oil to surface, demonstrating the viability of the Rona Ridge basement play. Lancaster has been further appraised by inclined wells 205/21a-4Z (2010) and 205/21a-7 (2016) and two horizontal producers, 205/21a-6 (2014) and 205/21a-7Z (2016). Both horizontal wells have demonstrated that the reservoir is highly productive with PIs in excess of 140 stb/psi/d. 205/21a-6 flowed at 9,800 bopd using an electrical submersible pump (ESP) and 205/21a-7Z flowed at 15,375 bopd using an ESP. Both rates were constrained by the rig rather than the reservoir. RPS Energy's 2017 Competent Person’s Report (CPR) revised the 2013 CPR by taking into account data from the 2016/17 drilling campaign. The revised Lancaster CPR assigns 2P Reserves of 37.3 MMstb to the EPS, and a further 486.1 MMstb of 2C Contingent Resources to the full field. In total, this attributes a Base Case recoverable resource of 523.4 MMstb to the Lancaster Field within licence P1368 Central. The Halifax structure is located in blocks 205/22b, 205/23 and 205/24, Licence P2308. Hurricane has a 100% interest in this licence. 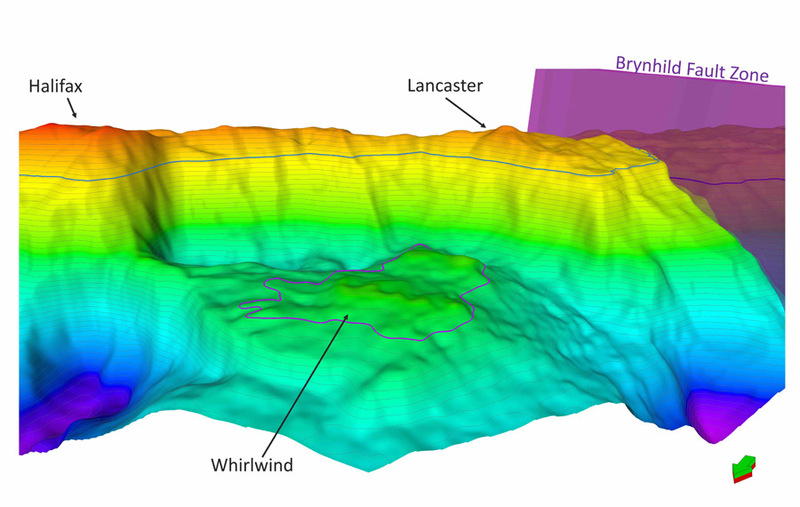 The Halifax discovery is situated on the Rona Ridge, northeast of Lancaster. It is Hurricane’s view that Lancaster and Halifax have the potential to be part of a single, large accumulation. A potentially sealing fault has been identified between Lancaster and Halifax by RPS in their 2017 Competent Persons Report. In either case, a significant volume of oil is present at Halifax, believed to be trapped by the Westray Fault Zone to the northeast. Hurricane drilled inclined well 205/23-3A on Halifax in 2017 which had an extensive basement section of over 1.3km in length. 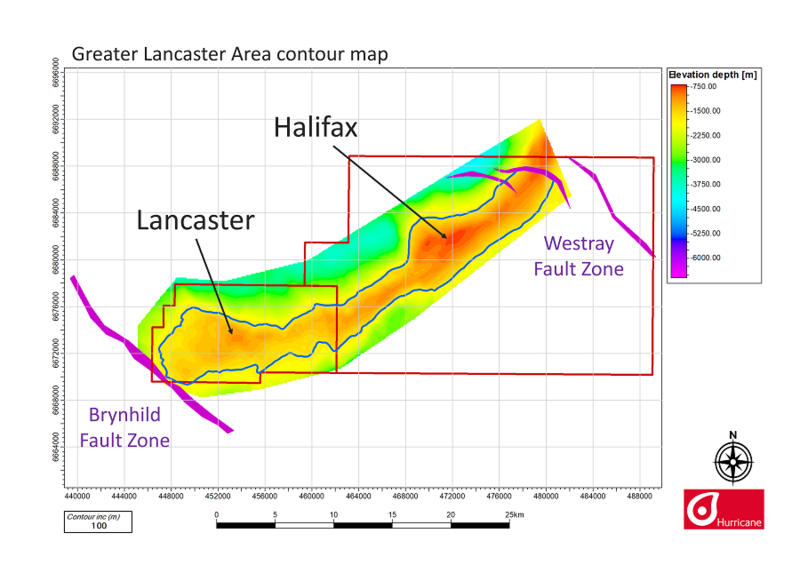 A significant hydrocarbon column was encountered that extends well below the local 4-way dip closure and is potentially deeper than the oil column encountered on Lancaster. Due to the basement being shallower at Halifax than at Lancaster, a gas cap is believed to be present at the crest of the structure. Further basement drilling is required to fully define the oil water contact on the Halifax Discovery. The image below shows the Lancaster free water level extending across both Halifax and Lancaster. In the 2017 CPR written by RPS Energy to cover the Rona Ridge assets excluding Lancaster, they have assessed the OWC evidence from the Halifax well and assign 2C Contingent Resources of 1,235 MMboe to the Halifax licence (P2308). The Greater Warwick Area comprises licences P2294 and P1368 South and is being appraised/developed through a joint venture between Hurricane energy (50%) and Spirit Energy (50%). The joint venture believes that the Greater Warwick Area (GWA) is a single hydrocarbon accumulation comprising the Lincoln discovery and the yet to be drilled Warwick prospect. 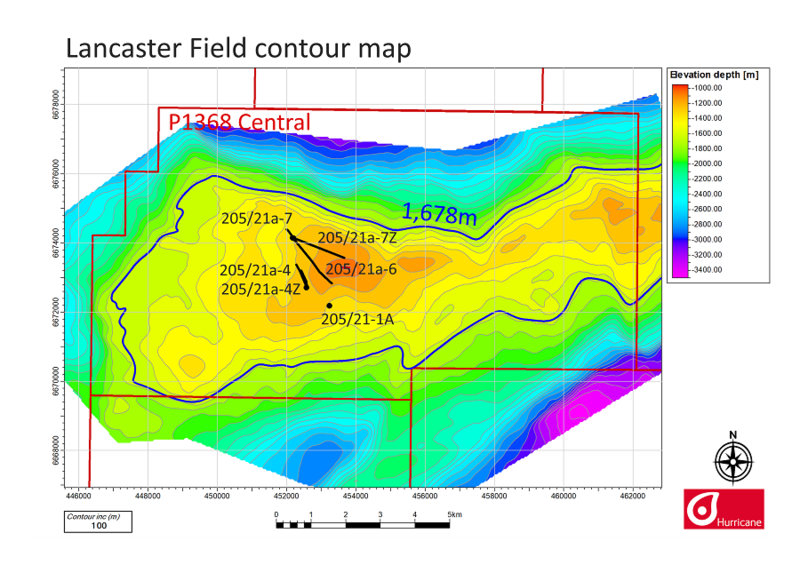 The joint venture intends to undertake a three well drilling program on the GWA during 2019 to evaluate the reservoir and fluid properties of the GWA and thereby provide new data that will aid in confirming/refuting the joint venture’s geological model that the GWA is a single hydrocarbon accumulation. The 2019 programme will include one well on Lincoln and two on Warwick. Located in Blocks 204/30b and 205/26d (Licence P2294). Hurricane has a 50% interest in this licence following Spirit Energy's farm-in to 50% in September 2018. P2294 is a licence block that covers part of the Greater Warwick Area, specifically part of the Lincoln discovery and Warwick prospect. The Greater Warwick area joint venture considers that the Warwick prospect is an extension of the Lincoln discovery. 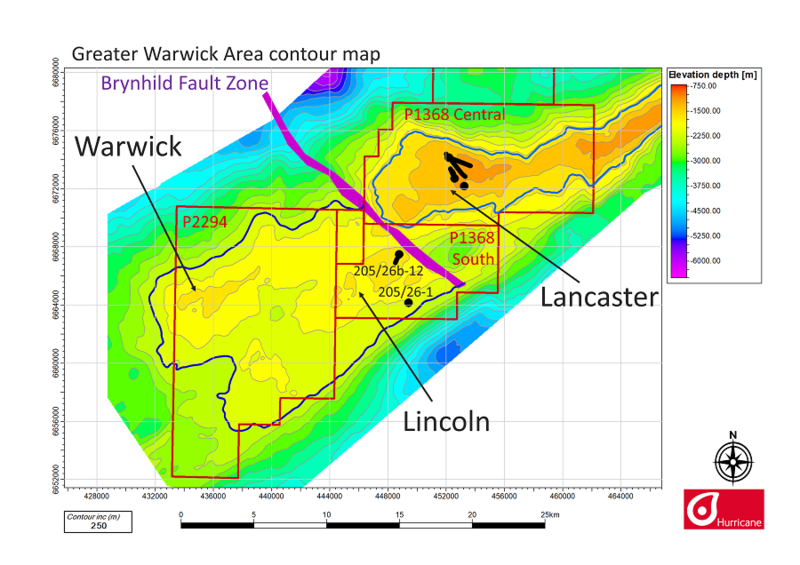 The depth of the oil column identified in the Lincoln well 205/26b-12 (drilled in 2016) means that Lincoln and Warwick could be a single continuous accumulation. The image below show the Lincoln and Warwick structures (collectively known as the Greater Warwick Area, or GWA), assuming the same contact across both. Three wells are planned to be drilled on the Greater Warwick Area with Spirit Energy in 2019, two of which will be in P2294. In their 2017 Competent Persons Report, covering Hurricane's Rona Ridge assets excluding Lancaster, RPS Energy concur with Hurricane the possibility of connectivity between the two structures, but have elected to take a conservative approach by evaluating them as separate structures, at least until a well is drilled at Warwick. They consider the potential for sealing faults in between the two structures and splitting the Warwick structure in two, based on seismic and gravity map data. This is shown on the image below (Figure 7.7 from the December 2017 CPR). RPS model a range of uncertainties in the CPR related Warwick, assigning Best Case Prospective Resources of 935 MMboe to Warwick (gross), with a 77% chance of discovery. Located in Block 205/26b, Hurricane has a 50% interest in this licence following Spirit Energy's farm-in to 50% in September 2018. The Lincoln discovery sits on the southwest limb of the Rona Ridge. 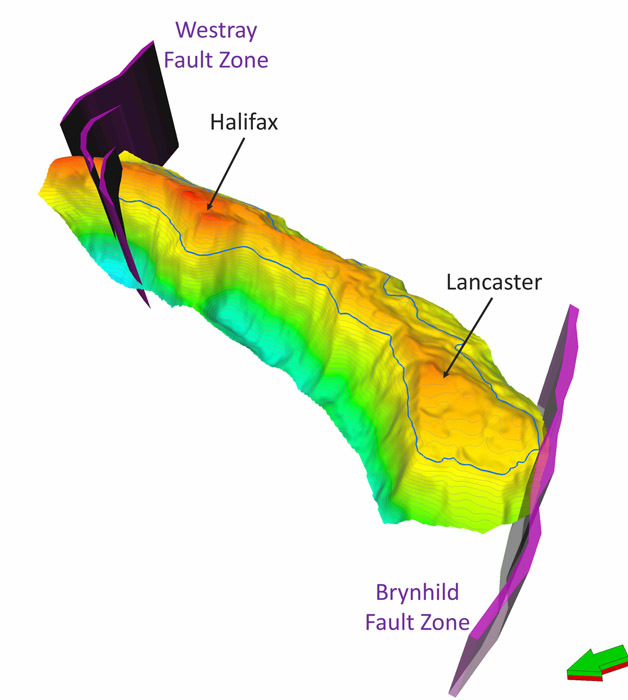 It is deeper than Lancaster and separated from it by the ridge-cutting Brynhild Fault Zone. Hurricane views Lancaster as a direect analogue for Lincoln. Hurricane drilled inclined well 205/26b-12 on Lincoln in 2016. 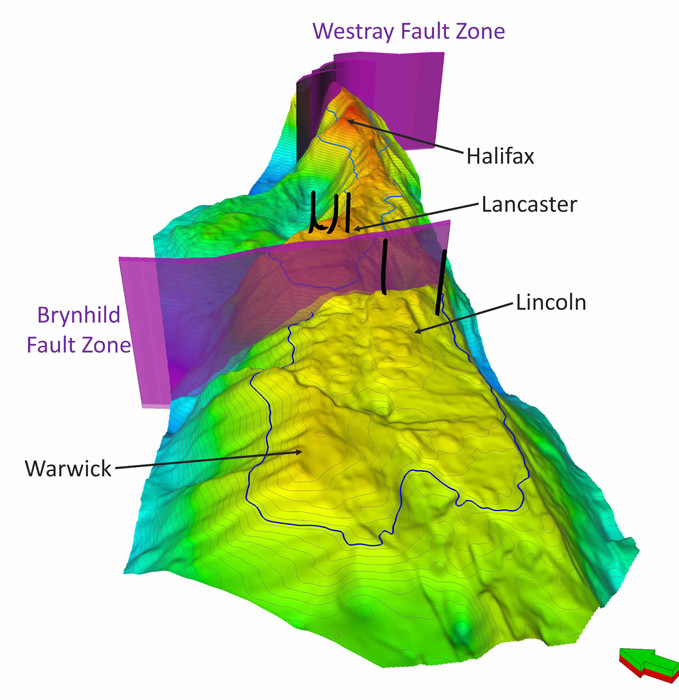 The well penetrated over 800m of basement section and encountered a fracture network similar to that seen on Lancaster with comparable fracture orientation, frequency and porosity. An extensive oil column was demonstrated by this well and geochemistry from cuttings plus analysis of isotube data indicates Lincoln has been sourced from the same kitchen as Lancaster. This information combined with gas chromatography data results in Hurricane anticipating that Lincoln should have similar oil properties to Lancaster. 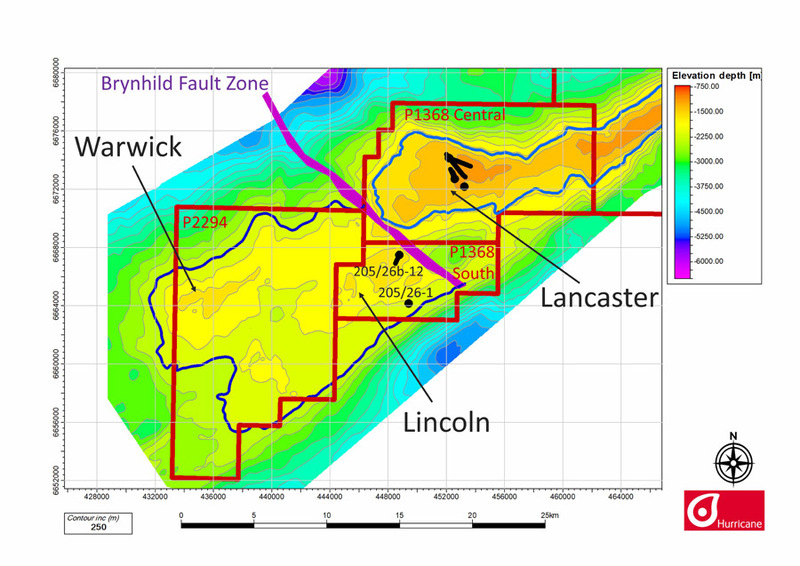 The Brynhild Fault Zone that separates Lincoln and Lancaster is believed to be sealing, preventing the deeper oil seen on Lincoln from moving updip to the shallower Lancaster structure. RPS Energy concur with Hurricane regarding the isolation of Lincoln from Lancaster in their 2017 Competent Persons Report (CPR) that covers the Rona Ridge assets excluding Lancaster. Whilst RPS concur that the GWA could have the same contact they have elected to take a conservative approach by evaluating them as separate structures, at least until a well is drilled at Warwick. Consequently the CPR assigns 2C Contingent Resources of 604 MMboe to Lincoln (gross). Located in Blocks 205/21a and 205/22a (Licence P1368 North). Hurricane has a 100% interest in this licence. 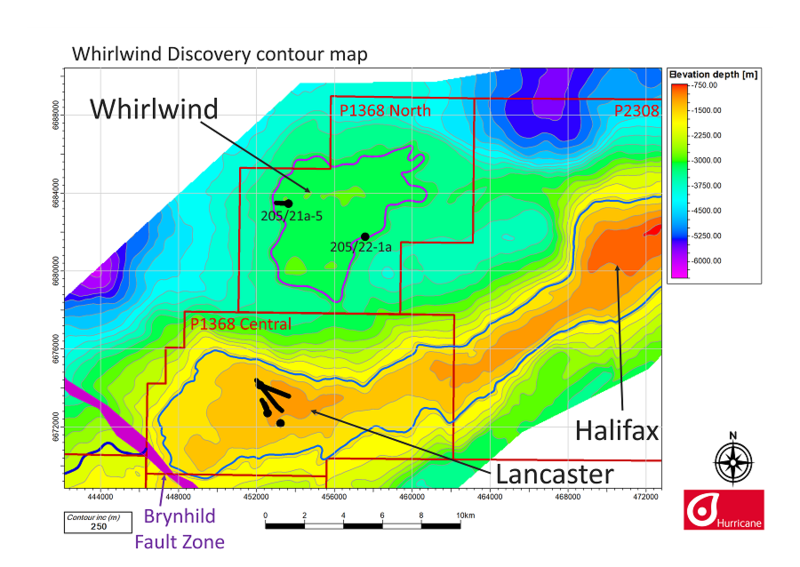 Whirlwind is a large, low-relief structure approximately 10km north of Lancaster, and was the second basement prospect to be drilled by Hurricane, proving to be another large discovery. The 205/21a-5 well was drilled in 2010 and re-entered for testing in 2011, flowing a light oil/gas condensate from an openhole test conducted over a combined Lower Cretaceous limestone and underlying fractured basement interval. The source of the hydrocarbon is the same as for Lancaster, though the precise composition of the fluid at reservoir conditions remains ambiguous. This well is currently suspended for future appraisal, with options including re-entry for testing or a possible sidetrack being considered. The Whirlwind structure is approximately 2,000 metres deeper than Lancaster, representing a downthrown terrace from the Rona Ridge. As such, the reservoir properties are broadly consistent with Lancaster, and should a gas export route become readily available then Whirlwind represents an excellent incremental project to the development of the area. In their 2017 CPR that covers the Rona Ridge assets excluding Lancaster, RPS Energy reconfirmed their earlier assessment of recoverable volumes on the Whirlwind Discovery. Depending on the fluid type (which may be a light oil or gas condensate fluid type due to current sampling uncertainty), RPS attribute 205 MMboe of 2C Contingent Resources in the oil case and 179 MMboe 2C Contingent Resources in the gas condensate case. *Range is gas/condensate case - oil case. Located 20km to the southwest of Lancaster, Strathmore is an undeveloped oil field that was discovered in 1990. Unlike Hurricane's other assets, Strathmore is a sandstone reservoir, not a fractured basement reservoir. Hurricane has a 100% interest in licence P1368 Southwest. The majority of the field resides within Hurricane's Block 204/30a. Unlike our other prospects and discoveries, Strathmore contains oil in Triassic-aged sandstones. The diagram below is a map illustrating the Strathmore asset, at Top Otterbank Sandstone level. The blue dotted line indicates the oil water contact. The red line indicates the Hurricane block boundary. Strathmore has been drilled by two wells, the discovery well, 205/26a-3, drilled in 1991 by Amerada Hess, and the 204/30a-3 appraisal well which was drilled in 1995. The discovery well was tested at a rate of 240 bopd by a DST in the Lower Triassic Otterbank Sandstone. However, 204/30a-3 was a horizontal well that was drilled mostly in the impermeable overlying Triassic Foula Sandstone and was not tested. 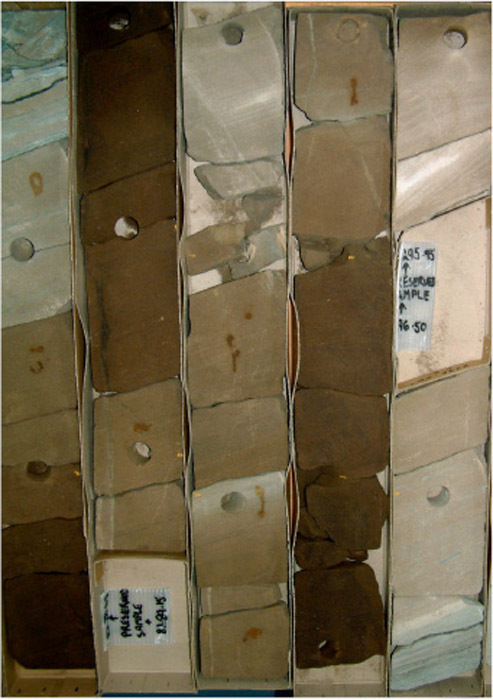 The image below shows a cored interval of oil-stained Triassic-aged fluvial sandstones from Strathmore discovery well 205/26a-3. Our industry stakeholders and related disclosures.